'Oohs,' 'aahs,' and 'awws' tend to follow this elegant, puffy white, cream, or biscuit-hued dog with the sweet, upturned smile. The Samoyed is an ancient breed whose thick coat kept them warm as they pulled sleds and herded reindeer thousands of years ago for the Nenet people of Siberia. Samoyeds are devoted to their families and are gentle and protective of children. They tend to be friendly with dogs and people they don't know, and easygoing companions to other pets. Sammies have a lot of energy and will get into mischief if you don't give them ample exercise and human interaction every day. Their stunning coat should be brushed often to prevent mats and minimize shedding. The Samoyed is often called Sammy, Sami, Smiley, or the Smiling Sledge Dog. In their native Siberia, they are called Samoiedskaia Sabaka or Samoyedskaya. Coat - The Samoyed's brilliant, medium-length double coat is a showstopper. The undercoat is soft, weather resistant, and warming. The outer coat is tougher and stands out from the body, giving the dog its signature puffy appearance that includes the tail, which curls over the back. The ruff around the neck tends to be bigger in males than females, giving them a larger mane. The coat colors are white, cream, biscuit, or white and biscuit. This working dog is alert and agile, with a graceful and composed bearing. She is muscular and compact, and moves quickly. Sammies have wedge shaped heads and triangular ears that stand upright. The corners of their mouths turn up, adding the appearance of a smile to their lively, engaged expressions. They are considered a 'basal breed' because they have not undergone as much genetic mixing as other modern breeds. Modern Samoyeds are a Spitz-type breed, descendants of the dogs of the nomadic Samoyede people who migrated from central Asia to Siberia thousands of years ago. The Samoyede followed herds of reindeer in order to have a constant supply of food, and their dogs helped them protect and herd the reindeer. They also helped pull sleds and hunt. Early Samoyeds were considered members of the family and lived inside tents with their people. The breed came to England in the 1800s and several decades later became a favorite of Queen Alexandra, who was a dog fancier and helped the Samoyed gain popularity. Because of their sledding skills and resistance to the cold, Samoyeds were used for expeditions to the South Pole. The American Kennel Club (AKC) officially recognized the breed in 1906. Samoyeds live up to their smiles. They are friendly and loving, though they save most of their amiability for family members. They are active dogs who thrive when they have a consistent job to accomplish with their people, such as agility training, a daily jog, or sled pulling. Sammies are people dogs and want to be near their families throughout the day. Are Samoyeds Good with Kids? Yes. Samoyeds are loving and gentle companions with the kids in their family. Supervise small children around your Sammy, because the breed is energetic and could knock little ones over. They'll adore older kids who are willing to spend time playing with them in the back yard and taking them for long walks. Are Samoyeds Good with Other Pets? Samoyeds accept cats and dogs with whom they've been raised and whom they consider members of their family. The breed has a strong hunting instinct, however, and may consider small animals they don't know fair game. If your Samoyed spends time in the yard, make sure she is well secured or she'll escape to chase down squirrels or the neighbor's cat. Samoyeds are alert, but not especially protective or territorial. Are Samoyeds Good Guard Dogs? Samoyeds pay close attention to their surroundings and will bark at the approach of strangers to alert the household. However, they are amiable at heart and don't tend towards aggression, even with unwelcome visitors. Modern Samoyeds still possess the high energy levels they needed to follow reindeer across Siberia. They get bored easily and need active owners willing to keep them busy. They're prone to barking and digging. Care and upkeep of the Samoyed coat is time consuming. They don't adapt well to being left alone. Indoor Samoyeds are highly attached to their families and should live indoors with them. They shed a great deal, so it's important to accept white hair and vacuuming as a big part of your life if you bring a Samoyed into your home. Apartments may be too small for this energetic dog, unless her owner can take her outside frequently. Outdoor The Samoyed's beautiful coat keeps her warm when it's cold and snowy outside, and its insulating qualities keep her comfortable in warm weather. But don't leave her outside in the yard in any kind of weather for very long, because she can develop separation anxiety and destructive behaviors, such as excessive barking and digging. Exercise Samoyeds benefit from several hours of physical activity each day, and changing up the activity is ideal for keeping them mentally stimulated. Endurance These working dogs have the stamina for long play and training sessions. Running Miles: Samoyeds make better jogging partners than fast running partners, but they will happily trot by your side for about five miles. Hiking Miles: Samoyeds will enjoy long hikes with you, of ten miles and more. If you live in an area with a lot of snow, they'll happily accompany you on cross country skiing or snowshoeing excursions. Food Generally, this breed requires about two to three cups of good quality dry dog food each day, given in two feedings. This amount varies, however, based upon your Samoyed's activity level and age. Talk to your veterinarian about the optimal diet and quantity of food for your Sammy. Alone Time Samoyeds don't appreciate being left alone. They become bored easily and will turn to destructive behaviors, including barking, chewing, and digging, to keep themselves occupied until your return. If you must leave, it's best for a dog sitter to spend time with your Sammy. The Samoyed's beautiful coat requires attention to stay that way. Daily brushing is a must to keep loose fur under control when the Samoyed seasonally sheds her undercoat. During the rest of the year, frequent brushing will prevent mats, get rid of dirt, and manage fur around the house. Bathe your Sammy every few months, or when she's especially dirty. Clean her ears with a gentle, dog-friendly cleanser to prevent dirt buildup that can cause infections. Brush her teeth several times a week, and trim her nails every month or so to prevent cracking. 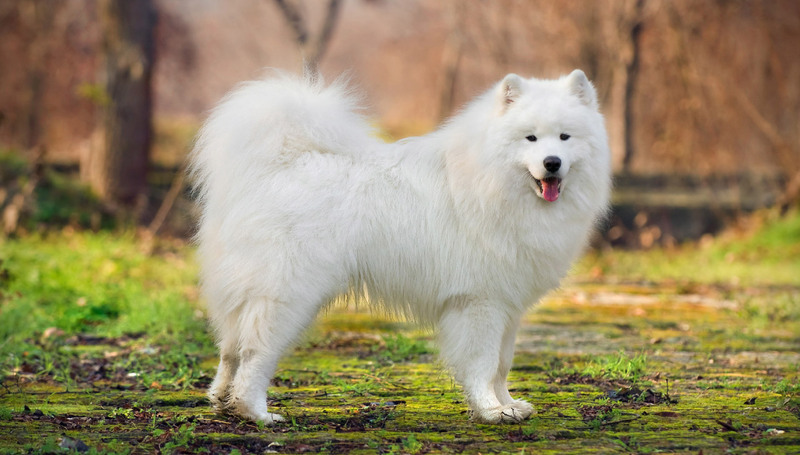 You can minimize serious health concerns in a Samoyed by purchasing from a reputable breeder who engages in responsible breeding practices, and through screening for common diseases and conditions. Samoyeds are intelligent, eager-to-please dogs who learn basic obedience commands quickly. Because they get bored easily, the best approach is to keep lessons short and offer plenty of positive reinforcement and praise. Agility training and dog sports training play an important role in keeping your curious, easily bored, and active Sammy happy and engaged. She relishes learning new things, and advanced training keeps her too busy to indulge her mischievous side. Though Samoyeds have a history of helping their early nomadic masters with hunting, they are not known for their gundog skills today. No. Samoyeds shed heavily and, as a result, release pet dander into your home. Dander is the cause of most pet-related allergies. Can Samoyeds Live in Hot Climates? Despite their luxurious coats, Samoyeds can live comfortably in hot climates as long as you keep them in air conditioning during the hottest part of the day. It sometimes gets hot in the arctic in the summertime, so their coats are adapted for the heat. In warm weather, Sammies will fully shed their undercoats so they don't get too hot. Additionally, the way the coat stands away from a Samoyed's body creates insulation that keeps her warm in winter and cool in summer. If it's very hot or humid, take your Sammy out only in the early morning or evening when it's cooler, and watch her for signs of overexertion or heat exhaustion. Do Samoyeds Like to Swim? Some Samoyeds may learn to like the water, but they aren't a breed that will jump into the nearest body of water to enjoy a swim. Their thick coats can make them feel weighed down when wet.